Dr. Sanjay Rajdev has completed his M.B.B.S from the Gandhi Medical College and Hamidia Hospital, MP, India in 1996. He continued to do his internship followed by MD (Internal Medicine), DNB, Fellowship in Cardiology (DM) from the Seth G. S. Medical College and King Edward VII Memorial Hospital, Mumbai, India. 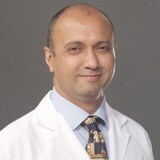 Dr. Sanjay further pursued fellowships in advanced 3D echocardiography and Interventional Cardiology at the University of Alabama at Birmingham, Birmingham, Alabama, USA before moving to the prestigious Mount Sinai School of Medicine at New York, USA where he spent one year learning cardiac and vascular interventions. His illustrious career in India was highlighted with 3 consecutive LIMCA book of records for year 2011 through 2013 and One India Book of Records. He now holds the distinction of performing the fasting primary angioplasty in India with door to balloon time of mere 16 minutes and maximum number of angioplasties in single day during routine working hours (16). Prior to joining NMC Healthcare he was a Consultant in Cardiac and Vascular Interventions at Seven Hills Hospital, Mumbai, India where he worked for 7 years. Dr. Sanjay also commands exceptional Professional Membership’s in various Professional Societies. He is a Member of the National Academy of Medical Sciences, New Delhi, Member of the American College of Cardiology, Life Member of the Cardiological Society of India, Life Member of the Indian Medical Association and Fellow of the American College of Cardiology. Dr. Sanjay also holds other credible privileges in his career. He has been meritorious right from his early school days where he received the “Vivek Vir Puraskar” award for exemplary performance in academics by the Madhya Pradesh State Government. He carried his legacy to Gandhi Medical College, Bhopal where he was awarded the “Best All Round Student” for year 1991-96. Apart from these honours, Dr. Sanjay also holds the President’s Gold Medal for overall excellence 1991-96, and Gold medals in Physiology, Pharmacology and Ophthalmology. He stood first from Seth G.S. Medical College and KEM hospital in the DM assessment exam in 2004. He was also selected as “Emerging Young Leader for Interventional Cardiology” by the Cardiovascular Research Institute at Washington Hospital Centre and Cardiovascular Revascularization Therapies (CRT) in 2009 and 2011. He has been an invited faculty in various national and international Cardiology forums. He has more than 25 publications in national and international journals and he is currently on the Reviewer Panel for 5 international journals. He is proficient in English, Sindhi and Hindi.